KidsFit 676 Elementary Skier is designed as a cardiovascular and core balance exercise apparatus for youth ranging in height from 42" to 68". Unique movement exercises the quadriceps, triceps, deltoids, trapezius, external obliques, and entire range of central core muscles including the transversus abdominis, back and pelvis. This unit provides balance trainging as well as complete cardiovascular and/or fat burning workout Adjustable floor levelers compensate for uneven floors. INCLUDES kids friendly computer (reads calories, speed, time, and distance) No external power required. Call 1-800-875-9145 to speak with one of our fitness advisors with any questions you may have. How do we put a price on our kids overall wellnes and their future - Go to FitnessZone.com today to order the KidsFit 676 Elementary Deluxe Skier and let's give our kids the advantage they deserve. 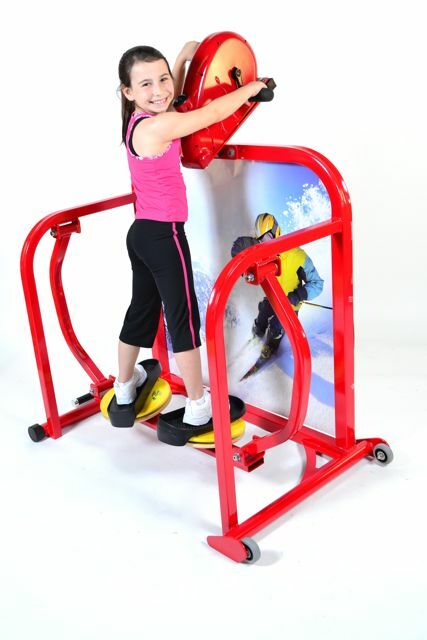 Order your KidsFit 676 Elementary Deluxe Skier from FitnessZone.com today!